Speedsurfing is a lot of fun and very exciting when going faster and faster, step by step. But be careful not breaking yourself or to much gear. One time I was totally down after breaking 1500,- euro's of equipment in 8 weeks. This was not fun!?! Best thing is to prevent all drama + damage. It is not a problem to crash sometimes, since I follow the rules below I haven't had any big damage. I will share this experience to safe yourself and your gear 99.9% of the times. This is an essential part of speedsurfing, take it serious! When you crash, try to keep your sailhand on the boom, it is no problem to release your masthand. This will make sure you will crash in front of the equipment. Much more safe compared to crashing into your equipment. Superstrong harnasslines are not favorite, these tend to break the boom when crash hooked in. The neilpryde race vario lines do a good job breaking in hooked-in crashes. 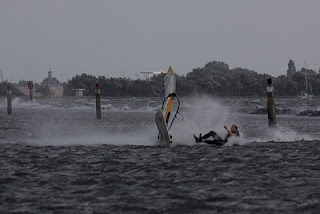 Speedsurfingblog is searching for more good working harnasslines for speedsurfing. This is most important when sailing into a sandbank, the lines have to break, otherwise everything else will break. After you crashed hard, check some vital gear. Example: When you crash hooked in and the harnassline&boom didn't break==> check out the boom for small cracks. You don't want to crash the next run because of gear failure. Windsurfing gear is good for specific conditions, when going in stronger winds than the gear is designed for you can damage the gear. Sailing always to big can be expensive, especially when you constantly are sailing on choppy places. I have broken a few things without crashing. Check at least once per month the mastfoot/extender system. When windsurfing on the edge it is needed to be fit, if you are tired and crash it is not good. Often I had slow reaction and no musclepower to throw myself over the gear, which resulted in a crash into the gear. There are 2 solutions, safe energy (wait a few minutes) for every run, or get into good shape. When you go really fast and there is no place to brake, just safe yourself, sit down on the water and release the gear. Helmet and Crashvest are recommended, when you don't get enough time (really strong gust) to respond it is impossible to prevent crashing into you windsurfing equipment. Something I don't get is the fact that not a lot of speeders are standard using impact vest and helmets? Thanks for sharing the tip, but is it still good secure in chop??? No problems with losing the harnassline at difficult waters?? I would say the benefit of releasing from the harnessline in a catapult is bigger than the slightly bigger risk of dropping out of the line in chop. Besides you (I) dont push that hard in chop anyway so the crashes wont be that severe compared to a high speed crash down a speedcourse. So far all my crashes with this bar I have been thrown away from gear, and that gives me confidence to try to go faster with less fear of crashing. It work for me but everybody have to try if its better for them or not. To my knowledge its only Dakine who ha a rollerbar option, but maybe you can fit it to other harnesses. ik heb nog een vraag, moet je proberen tijdens de crash voor je zeil te springen, een soort van uit de trapezelijnen springen? of gewoon ingehaakt blijven en je achterste hand blijven vasthouden en ingehaakt crashen? (of haak je dan automatisch uit)?